On the morning of July 9, 2009 I took a pregnancy test. I didn’t really think I was pregnant, but I was late, so I figured it couldn’t hurt to be sure. Imagine my shock when it was positive! I ran in to tell my husband…we were thrilled and terrified. I took 5 more tests just to be sure! That evening we told my parents, then everyone else we knew. It was so exciting! We hadn’t planned it, but we were having a baby! It felt like a miracle. I was diagnosed with polycystic ovarian syndrome, or PCOS in high school. I was told back then that I’d probably have trouble getting pregnant. I’ve had painful cysts on and off since then, including one that required surgical removal. I just assumed when we wanted a baby, we’d find an OB to refer us to an RE and we’d do whatever it took to make that happen. So, finding out we’d conceived without trying and with no planning on our part felt like a very happy miracle. I thought this baby had such a purpose. I was thanking God for our little surprise blessing. Within two days of finding out, I was sore and nauseated and exhausted…I was pregnant! But then on the 5th day, I started spotting…Just light brown, nothing my doctor was really worried about. My symptoms continued through that week, and I thought I was ok. Then on the 19th, I noticed they disappeared. Abruptly. I no longer “felt” pregnant. I wasn’t nauseated. My breasts weren’t tender. I wasn’t tired. I was worried. The next evening, Monday July 20, 2009, while attending a visitation following the sad death of my friend’s mother, I started bleeding heavily. By Tuesday morning there was no question. I was in serious pain, I was passing clots, and I was bleeding heavily. I was miscarrying our miraculous baby at only 7 weeks 1 day. I went to the doctor and they confirmed we were losing the baby. We were instructed to go home and wait. They told us what to expect, and it all went as they said it would. I didn’t see the baby- and I was thankful for that. But I did see the tiny sac where my baby had lived. It came out all by itself in the shower. I held onto it for almost an hour, waiting there until the water ran cold, and my tears ran dry. That sounds gross to some people, but that tiny sac was all I had left of the baby I thought I would welcome home in March. The physical pain was not as bad as I expected, honestly. It was only terrible on Tuesday. The following days were manageable with Tylenol and rest, and by the next Monday it was all over. My hcg dropped from 56,000 to 14 in less than two weeks. In less than three weeks, I was back at zero. What shocked me was how deeply this affected me emotionally. When you get that positive test, you don’t for one second think about the teeny embryo in your body. You think about your infant. Your toddler. Your nursery. I was thinking about only having 5 years to figure out how to pay for private school! I was a mom from that first minute. Then, in one horrifying moment, I realized it was all coming to an end before it even got started. I’d never know this baby at all. It was such a terrifying way to experience pregnancy for the first time. I don’t know if I’ll ever be able to feel that same elation I felt when I saw that positive test. Next time it will be mixed with such fear… what if this happens again? Thankfully, all the things we were waiting to accomplish are in place! We will be trying again in March of 2011. I am very apprehensive about facing another loss, but as time has passed, the fear has subsided somewhat. Next time, I will be more cautious about getting my hopes up. Next time, I’ll wait until I’m 13 weeks to make an announcement. Next time, I will hope for the best, but I will be prepared for the worst. Next time, I will know that pregnancy is a gift, and in the early weeks, that gift can be fleeting. Next time, I’ll spend more time loving every moment I have carrying my baby than planning the future. I love you, grasshopper. Thanks for making me a mommy. I also have PCOS and we had been trying for 8 months to have a baby on our own. 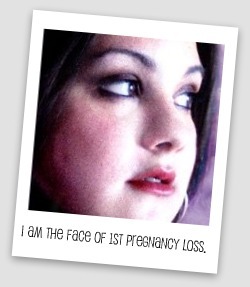 I lost the pregnancy at 4 weeks and your story reminds me of my own. From the moment that test was positive, I was a mother and I will always be a mother. Thanks for sharing your story. I also had a surprise first pregnancy that I was so excited about. I had started planning everything and was getting excited. I miscarried. That baby is my first born, and will always be. Thank you for sharing.